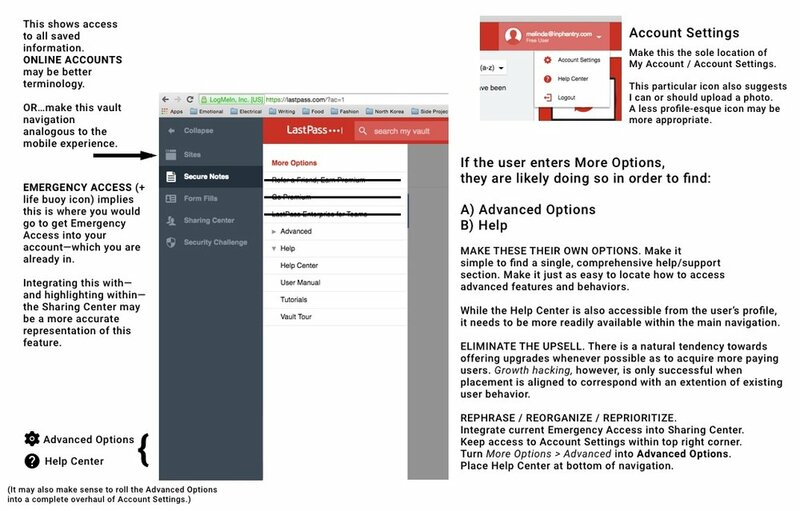 In April 2016, I worked with LogMeIn's UX team as a UX researcher and writer to make recommendations on how to improve the user experience of LastPass, a recently-acquired password management tool. I focused primarily on their web application, but also sought to coalesce the desktop and mobile experiences. LastPass has been a trusted online protection tool amongst the tech-knowledgable set for nearly a decade. As widespread demand for greater cybersecurity grows, LastPass must expand their target audience beyond the engineering set — and begin to consider that functionality is nothing without usability. When your hero doesn't act very heroically. When you're messaging without thinking about what you're saying and how you're saying it, people will cease to give you their absolute attention. And when you're saying too much, how do you expect a prospective user to discern what it is you really want them to do? Reexamine your primary message. Reduce your calls-to-action, and think carefully about asking your user to pay for an upgrade before they've even downloaded your basic, always-free password management tool. Perhaps there is a happy medium. Perhaps not. But please, never ever ever issue two equally-weighted CTAs targeting everyday consumers and enterprise users in the same space. When your vault is super secure but you can't find anything. Both web and mobile applications needed a revised information architecture that followed some semblance of a user journey — and distinction between certain features. When your support center has no idea who it is, how can they help others? The support center is also a help center is also a knowledge base is also tutorials is also FAQs is also a user manual is also an identity crisis. When your footer is so weighed down and it can barely stand. Your footer should never look like an episode of Hoarders.